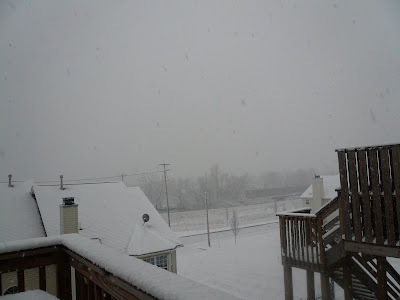 Snippets of My Life: Winter Storm!!! In my part of the country, winter has finally arrived. 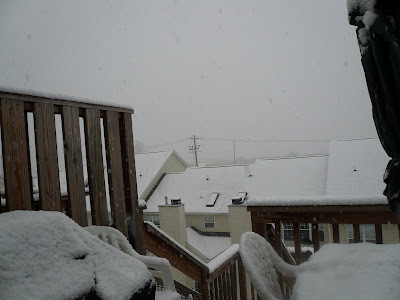 We are in the mist of snow now and so far is already 2" of accumulations on the ground. Is a mixed with rain and sleet and makes driving impossible. Carlos is still at work and he is going to leave his truck in the office and hitch a ride from a colleague. The sooner the snow comes, maybe the sooner it will end. That is what I kept telling myself. Hopefully this winter won't be as bad as the last one where I had to shovel a lot. It's the price one has to pay living in a place with 4 seasons. Hopefully it will stop soon. 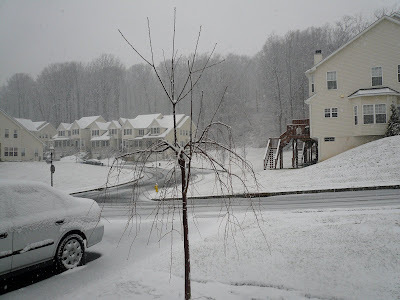 For those of us out here in the hot sun, it is such a beautiful sight - snow covered trees and houses. But, yes, snow storms can wreak havoc. wow!! your snow look so beautiful...but I'm glad I'm going to lari kuat kuat for this coming months.Love Spring but not winter. Pinky, this snow was not as bad. Still can managed the shovelling. Hope it won't get worst than this one. shoveling and driving wud be the nightmare whenever the snowstrom hits. and yeah, i too hate when it snows AND rain at the same time.